Ah, how times have changed. 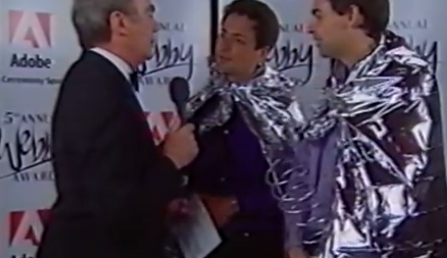 2000 was quite the year: we didn’t die from Y2K, gas only cost $1.26/gallon and we all used to wear silver capes…WAIT! WHAT? Yes, the folks behind The Webby Awards have uncovered lost footage of Larry Page and Sergey Brin after they won their first award back in 2000. The Web was a much different place back then, and it continues to evolve with this year’s event, happening on May 21st in NYC. In 2000, Larry Page and Sergey Brin, founders of Google, accepted a Webby Award for Technical Achievement. Four years later, Google’s initial public offering took place for $1.67 billion dollars, and today, Google is worth $197 billion dollars and is an essential part of every Internet user’s experience. Watch history in the making at the 16th Annual Webby Awards hosted by Patton Oswalt this Monday, May 21st on http://webbyawards.com. Red Carpet starts at 4:30pm ET and the Show starts at 5:30.